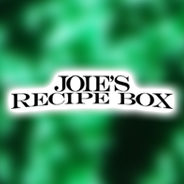 I have started a new blog devoted entirely to Recipes! Please follow my new blog!! Tonight was the results show. I loved the little acts they had the contestants do! First up was Scotty and Lauren with Randy Travis’ “I Told You So.” I loved it!! Those two sounded great together. In my opinion, I think Lauren’s voice was so tender. Loved it. Scotty starts doing those weird facial expressions. Oh well. I do wish I could buy the single! Next up was Jacob and Naima singing Ashford and Simpson’s “Solid.” The dancing and the singing was just awkward. Their voices were just…odd…together. Not my favorites in the competition anyway. I’m not a bit surprised that Naima is in the bottom three. Oh look, Fantasia. She looks…different. 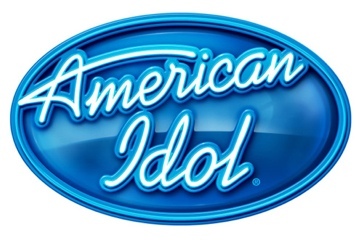 The next contestant act was Haley, Thia, and Pia with Katy Perry’s “Teenage Dream.” Cue the Warbler’s from Glee, please. 🙂 I was surprised to see that Pia could do something more than a ballad, as odd as it may seem, lol. Thia. Whatever. Haley, she’s cute, but seems like she would be annoying in person. Thia in the bottom three. Not suprised. Is it time for my fave? James? Yep. It’s James, Casey, Paul, and Stefano. They rocked it something amazing. They sounded like the Beatles. 🙂 Of course, this means they have to send someone to the bottom three. 😦 I like all the guys. Paul in the bottom three. His voice tends to drive me crazy, but I don’t want him to go home yet. As long as it’s not James. Oh look, Jamie Foxx and irritating will.i.am. eyeroll. Rio looks good…and cool dancing. Then, they start singing. Next. It looks like Paul will be here next week. Only three girls left. Let’s hope they can bring it. I love Pigeon Forge. I love the whole touristy thing. I really do. I could live there and love it. The traffic can be unbearable, but think of how many people you’d get to meet! I love it. Well, I’m off. Talk to you soon! 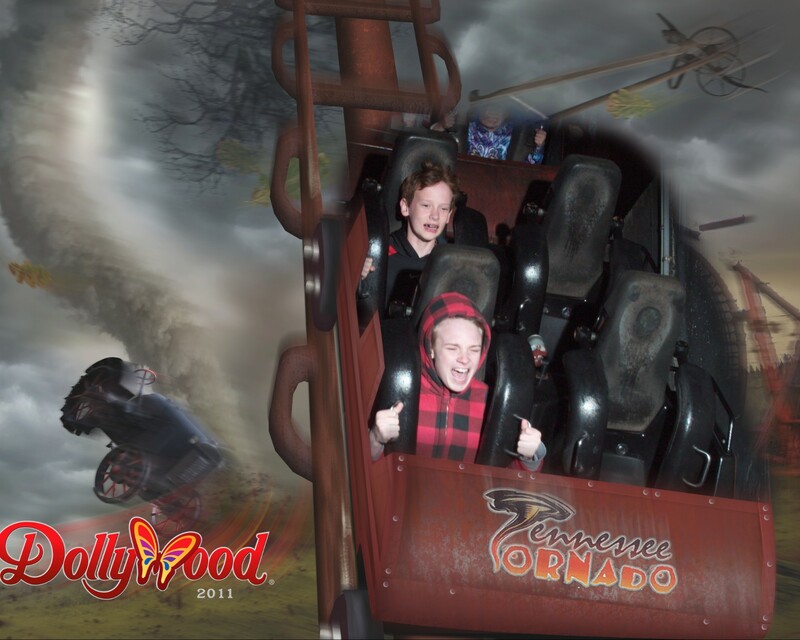 This past weekend, after a long, cold winter, Dollywood opened up for it’s 26th season. 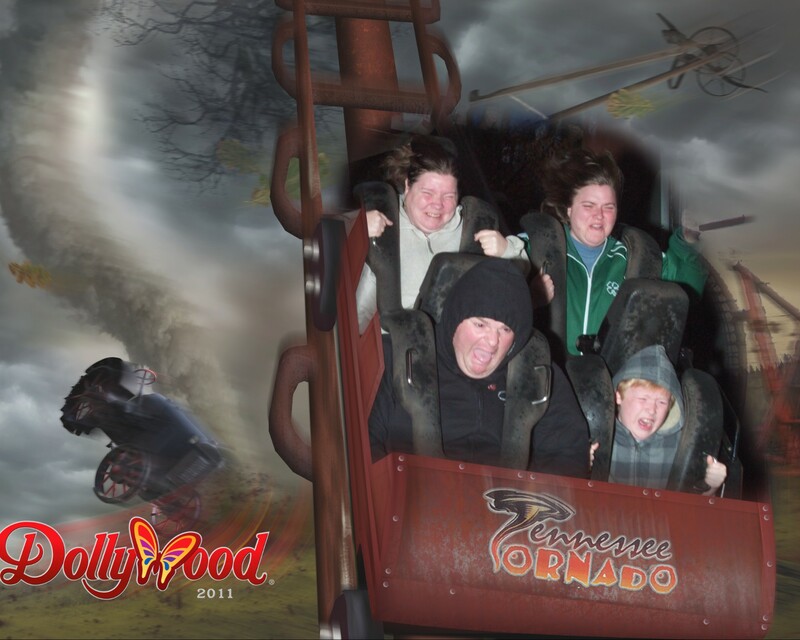 With much fanfare and aviator sunglasses, Dolly pulled a lever on the newest addition to the park, the Barnstormer. The Barnstormer is located in the new Owens Farm section of the park. You may know the section by it’s former names of Daydream Ridge and Dreamland Forest. The Barnstormer is an S & S Power Screamin’ Swing. Enjoy the same breathtaking moments that daring stunt pilots of the1920s might have experienced as they zoomed over the fields of nearby farms. The $5.5 millionBarnstormer features two pendulum arms with seating for 32 riders. That section is beautiful! The old “Critter Creek Toys”/”Tree Trunk Treasures” store is now “Granny Owen’s Toys, Gadgets and Tools.” They’ve done some remodeling in the store and they sell some cute new merchandise relating to the Barnstormer. The old “Daydream Diner”/”Mountain Dan’s Burgers”/”Ranger’s Cook House” is no more (although the restaurant has been gone for the previous two seasons. Instead, the old queue and seating areas for the restaurant have been converted to “Granny’s Garden” and the “Pig Pen.” “Granny’s Garden” utilizes the old “Tiny Tots Playground” crawling structures and the “Pig Pen” relocates the former “Bullfrog Creek” squirting fountains from the old Dreamland Forest. It’s a very cute section and kids really seemed to enjoy it. The Barnstormer itself takes up a huge space, but a new crawling structure/play area has been built next to it. It’s a crashed bi-plane with a slide and other features. With all the changes to Daydream Ridge/Dreamland Forest/Owens Farm over the years, one constant attraction in that section is the Mountain Slidewinder. It’s still there, with a little bit of a new entrance/sign. 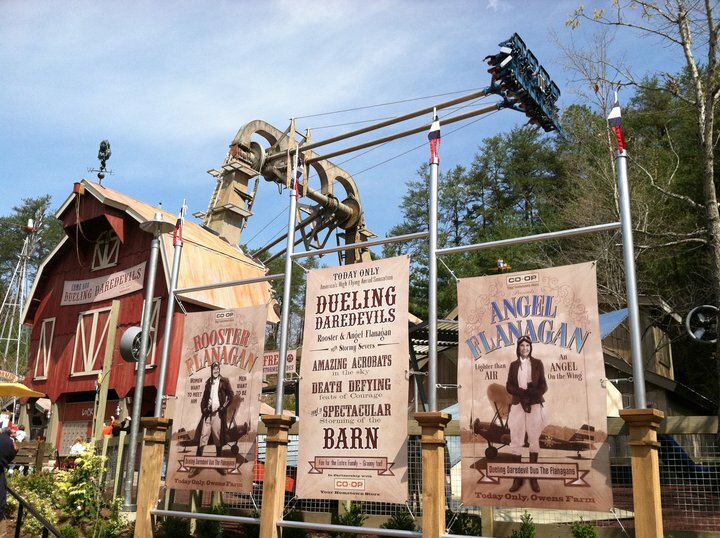 It’s a fantastic section and Dollywood really outdid themselves. The weekend also saw the opening of Festival of Nations. Three new shows include: Samaia: Legend of the Caucasus, a show from Georgia, Oisre, a show with the music of Ireland, and Los Pampas Gauchos, from Argentina. It also brings the return of Drum! from Nova Scotia, Canada. It’s a personal favorite of mine, and a must-see! Festival of Nations will be featured now until May 2nd. “Red’s Drive-In” has had a complete renovation. They’ve enclosed the carport area of the restaurant (where the classic cars used to be) and also part of the outdoor seating area to make additional indoor seating. The counter has changed in the fact there are several more registers with an improved flow to the speed of service. The food has also changed! The installation of a charbroiler brings charbroiled burgers and chicken sandwiches. The burger bar with just lettuce, onions, tomatoes, and pickles has been changed to include sauteed mushrooms and onions, as well as relish and salsa. A big improvement! “A Touch of Ireland” and “Old Flames Candles” have swapped stores. “Uncle Bill’s Music in the Valley” is now located in part of the “Valley Carriage Works” building. The “Sweet Shoppe” has changed some of it’s building, too. The Taffy Kitchen, that used to house Mr. Percy (the talking stove), has been repainted to a bland (in my opinion) white walls with colorful trim. Also, they have built a “lollipop tree” in the middle. It’s neat, but I think it looks boring. The “Tater Patch” now serves Petro’s Chili and Chips (complete with Hint of Orange tea!). Of course, my trip to the park wouldn’t have been worth it without a ride on the Tennessee Tornado! I also bought the butterfly jump drive they sell to acquire the ride photos, entrance photos, etc. for only 6 bucks! 🙂 Here are my family’s pictures. I am glad I’m getting to post on a blog again. I had forgotten how therapeutic it is. Until later, be good, world. So, I’ve missed blogging. It’s been too long. For some crazy reason, I’ve deleted all my old posts. Not sure why. Oh well. I guess I’ll start over. Kinda exciting, ya know? Sometimes a new start is just what you need. This blog has had so many versions it’s pathetic! Well, I guess that’s me. It’s how I roll. I’m happy to report that I’m down 10 lbs, which makes it 20 from my original starting weight. 🙂 I’m very very happy about that. This time, it’s been coming off slower than before. I think it’s a good thing. I have been doing the elliptical a whole bunch. When I first started going to the gym, I couldn’t do the elliptical. It was too hard for me. I could tire too easily. Now, I’m doing at least 5k on it daily!! In May 2010, I ran a mile for the first time ever. It took about 17 minutes on the treadmill. Now, on the elliptical, my best mile (today, 3/29/2011) is 5 minutes and 10 seconds. My first 5k was in June 2010. It took about 45 minutes on the treadmill. Today (3/29/2011) I did it on the elliptical in 19 minutes and 50 seconds. My stamina has vastly improved. I’m seeing results! It’s so rewarding. Hmm, what else is new? I’m an assistant manager now. That’s good. Thanks for stopping by. Come back soon!! !